Freshly pressed: a review by Thomas Watters of twenty Weinlandipoma species from Hispaniola, with description of seven new taxa: W. charybdis, W. corbis, W. formonense, W. gregoi, W. pruinosum, W. silmarilium, and W. tylotum. Species are distributed on either the Massif de la Hotte or the Massif de la Selle on the Tiburon Peninsula of the island. Most are locally endemic, often confined to a single mountain peak or slope or island. All are currently susceptible to extinction. This is another sound contribution of Watters to the malacofauna of the Caribbean area. Watters, G.T., 2017. 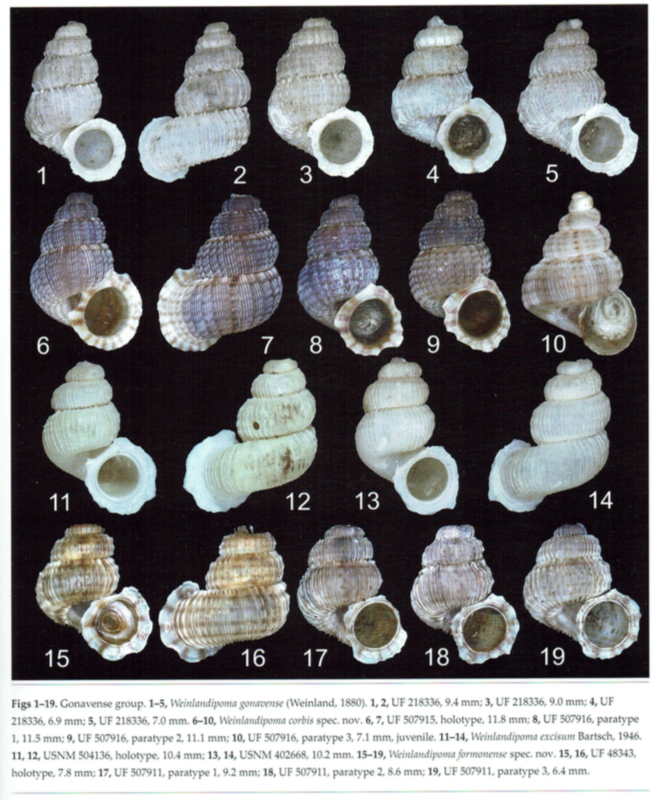 A review of Weinlandipoma (Gastropoda, Littorinoidea, Annulariidae) from the Tiburon Peninsula of Hispaniola: imperiled local endemics. – Basteria, 81 (4-6): 65-89. This entry was posted in Uncategorized and tagged annulariidae, literature, types, West Indies on December 21, 2017 by bramb.